Young reformers Lena Lothring and Julia Braband are keeping Martin Luther and the Reformation firmly planted in the lives of young Lutherans worldwide while learning about climate justice by planting trees. Members of the Evangelical Church in Central Germany (EKM) who live in Magdeburg, Saxony-Anhalt, they led a team of 10 volunteers, reached out to more than 400 Young Reformers globally who planted 153 trees – and they are still planting. 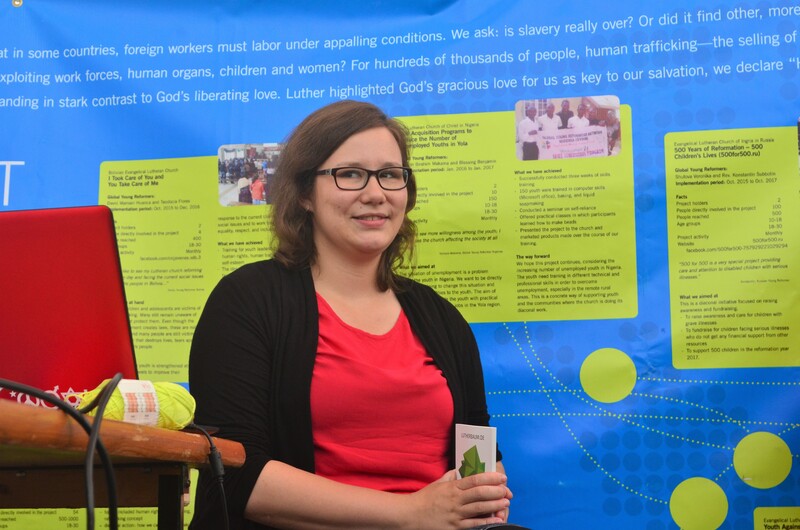 The project, which officially ran from 31 October 2015 (Reformation Day) until the end of 2016, also raised awareness around environmental protection and youth participation in the church in Germany and worldwide. The Lutheran World Federation (LWF) launched the Global Young Reformers Network in 2014 to encourage more young people to contribute to the life of member churches, and take part in 2017 commemorations of the 500th anniversary of Luther’s launching of the Reformation. Through the global network, young reformers from all seven LWF regions have developed 54 “Living Reformation” projects focusing on the Reformation anniversary sub-themes stating that salvation, human beings and creation are not for sale. They have reached more than 25,000 people with their local initiatives. They are currently meeting again in Wittenberg where they are presenting their ideas to the general public at the World Reformation Exhibition. The “Luther Trees and Geocaches” project is reaching out to all age groups through the global game geocaching, which involves hunting and finding hidden objects using global positioning systems (GPS). Since the beginning of the project, the young reformers have given out postcards promoting the Luther trees, created a website in German and English and planted a Luther tree at the EKM youth camp in Volkenroda. “I want my church to be more open to new activities like our tree planting project. I also want to see more ecumenical projects or statements that we do together as followers of Christ,” commented Lothring. The planting of trees to honor Luther or the Reformation has a long history in Germany. Oaks, beech and lime trees have been planted to mark Luther’s 400th birthday in 1883, and in 1917 to commemorate the 400th anniversary of the Reformation. The Global Young Reformers Network has been crucial in the success of the project, helping organizers reach out to youth and other age groups. It started in Germany with tree plantings and geocaching at youth festivals but thanks to the LWF network, went global. “Young people have told us that they like the project very much because they didn’t know about the Luther trees at all and, through geocaching and through the project, they have made new connections with the places they live and their local histories,” concluded Braband.